Today I’m SO excited to share some very exciting news!!!!! As you can see from these photos from our time in Florida, baby number two is on the way and we could not feel more blessed. This little baby (who already is kicking up a storm) was a BIG surprise!!! It took me a year (and one round of clomid) to get pregnant with Isla Rose so I never would’ve imagined I would get pregnant with my next baby so quickly! When Drew and I went to Italy together in January we had a 10 hour plane ride to discuss all sorts of topics. One of those topics was planning when we would start trying for our next baby. We both decided shortly after Isla’s first birthday would be perfect timing. That way they would be close in age but would give me a little bit of a break between pregnancies (I get super sick, morning sickness all. day. long.). Little did I know that during that conversation, I was already pregnant!!!!! I’m not going to lie, I’m super nervous to have two babies so close together in age but I know they will be the best of friends and it will all be worth it. It’s crazy to think that this time last year I was pregnant with Isla and now I’m pregnant AGAIN! We can’t wait to meet this little baby who is already so loved and is getting pretty lucky with the best big sister and fur brother ever! I always get tons of questions about the camera I use, especially my camera for capturing family moments. I use the Canon EOS Rebel T6i DSLR with the EF 50mm f/1.4 lens and the EOS 5D Mark II with the EF 85mm f/1.2L II lens. These photos were taken with my Rebel and EF 50mm lens (it’s way lighter than my EOS 5D Mark II and it has wifi!). I can’t wait to continue documenting my pregnancy and fun life memories with my Canon cameras!! Stay tuned for more updates along with some of my how-to’s when it comes to photography and capturing special moments. Congratulations! Wow, you hod that bump well! I have three kids all close in age and I love it. I won’t lie, those early years were rough, so much work, but you are front loading your work. When your kids are older (mine are 5, 7 and 9) it is so easy, they play together all day long. Best wishes and I love your blog! Thank you Anni! I’m so grateful for your comment because I feel like we all have our own experiences and can share them with others to help build each other up and remind ourselves that nobody’s life is perfect and we all go through difficult times. Thanks for sharing part of your story! Your kids are lucky to have you!! Yes, thank you for sharing! I got pregnant with my first quickly and then pregnant again when she turned a year, we lost that baby and now it has taken over a year of trying and still no luck. It’ comforting to know that other people go through the same struggles. Yay!!!! Congratulations!!! So happy for you!! Thank you Federica!!!! We are so excited! Congratulations to the newest addition of the family! Thanks so much Jeannie! We can’t wait! wow, that was quick! Congratulations!! Haha, very quick!! But we are super excited! How exciting! Congratulations. Such a cute swimsuit too. Congratulations!!! How exciting! You have the cutest baby belly! How wonderful to find out in Italy. New clothing line and now a new bang. Life is good! Eek congratulations Rach! That baby is so lucky to be so loved already! You are so sweet Caitlin!! We already love this babe so much! YAYA! Congratulations! I loved your style when you were pregnant with Isla, and cannot wait to see how you style this baby!! Such an exciting time! Thanks Mich!! We are so excited! Haha there’s definitely only one heartbeat, so we will see! We find out in a couple weeks :) I think Isla and Dash will be the best siblings to this new addition though!! Yay! How exciting….we hvae 2 and just found out i have pcos…….and after no baby #3 in the last 5 years we are starting clomid this month in hopes of our 3rd! Thank you so much Michaela! You always leave the nicest comments and I love reading them, so thanks!! Ah, I’m so excited for you! I was honestly expecting this announcement when you announced your clothing line! I am currently 2 weeks away from my due date with baby #2, and my first is 15 months old, so I got pregnant when she was 6 months old. Definitely not my idea, but I plan and God laughs, right? Hopefully this pregnancy won’t be too hard on you! Congratulations! How exciting!!!! 2 weeks is super soon! Ya sometimes surprises happen ;) haha. Enjoy that new baby! OH WOW!!! Congratulations!!! These are such an amazing news!!! Haha thanks Natali! We are super excited. Congratulations! Very exciting news for you and your family! Congrats on baby #2! You look amazing. I love that swimsuit. Oh my, you are so nice! Thank you! I feel most comfortable wearing a bikini when I”m pregnant haha. Oh my! Congraaaaaaats!!!!!!! How exciting for you all. I did the same thing and ran and told my sis first too ;) I look forward to seeing all the pics along the way. You already look adorable. HUGE congratulations!!!! I couldn’t be more excited, you would swear it was me that was pregnant lol! It’s been so wonderful watching your family grow over the past few years. Thank you Leanne!! I always love and appreciate your sweet comments. They mean a lot to me!! Thanks Sadie! We are beyond excited! So excited for you!!! Cogratulatuons to your beautiful family!! Congratulations Rachel! Such exciting news. Thank you!!! We are seriously thrilled! Congrats and you are a cool girl! Haha right?! Thank you Veronica! Congratulations! Two babies so close together will be so fun! Best wishes! Omg congrats!! When are you due?? You look amazing! I’m almost half way! :) Thanks Rebecca! Congratulations! Fam goals, as usual. I am so so excited for you and your little family, the biggest Congrats! I had a very similar similar situation happen where we tried for 1.5 years for my son and 3 rounds of clomid before we were blessed and said with the next one we just were going to “try not to try”. Well my son is 15 months old and I am currently 8 months pregnant with our sweet little girl due in June. What a blessing to grow your family. I have followed your blog for a long time and am so excited to be a part of your journey. All the best to you and your sweet family! Oh how exciting Megan! Congrats :) Our situations are VERY similar haha. Wishing your family the best as well! It’s so funny because the other day I was watching your snaps and wondering when you’d plan for baby #2! Isla is just too adorable and I bet she’ll be thrilled. Can’t wait to see your pregnancy fashion again too! Haha ya I’m glad the news is finally out now!! :) Thanks Rachel! Omg congrats!!! That is such exciting news! Oh WOW! What a surprise! Congratulations! This is amazing news! Congrats to your beautiful family! 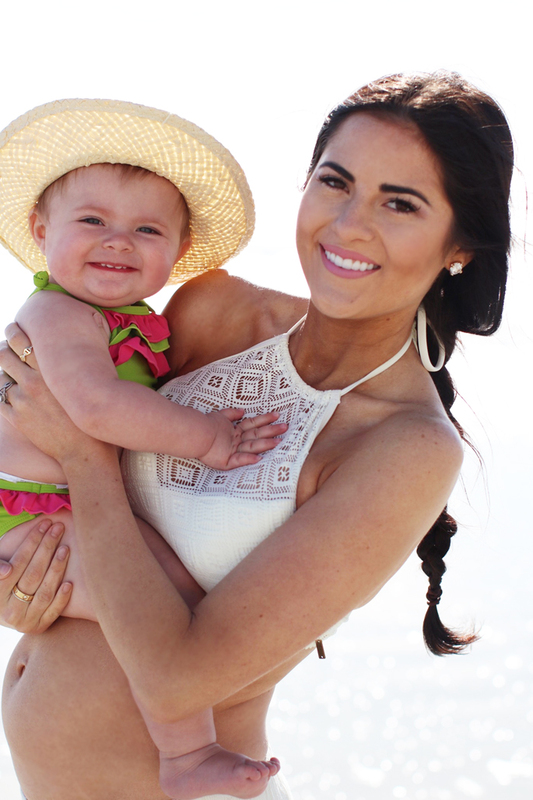 You need to get your sweet baby girl in some of the baby Lilly Pulitzer Shifts! I had a hard time getting pregnant with my first (and then one period and surprise!) as well. My two boys are 18 months apart. At times it can be crazy but I wouldn’t imagine it any other way! It’s been a huge blessing and so much fun! Congratulations!! Oh my gosh, that’s almost exactly like me!! haha I can’t wait :) Thanks for reading! My sister and I are only 18 months apart and I wouldn’t want it any other way- she’s my absolute best friend and always has been. I think you will handle the two of them very well! Oh I love that!! I know it will be so fun to have them close together :) Thanks Grether! A big congratulations Rachel! You look gorgeous! Maybe you wont get morning sickness this time around! Thanks Nina!!! Oh I definitely did the first trimester! But I’m feeling much better now, thankfully haha. This is absolutely wonderful! I am so happy for you! CONGRATULATIONS!!! Babies are truly God’s little blessings! Hope you’re feeling better this time around. Every pregnancy is different! Warm wishes to you, Drew and big sis Isla! Congrats!! This is sooo exciting! This is making me excited to try for baby #3, our 2nd baby boy was born the same week as Isla and I would love to have them close together also. This baby is going to be so blessed to be a part of your little family! Wow! So awesome! Congrats! Beautiful photos and news as always! Rachel! Congratulations, you are so beautiful pregnant. I love the pictures of baby Isla Rose! Cannot wait to watch your bump grow. So excited for you and your growing family! The first two (of our 4) are 20 months apart and its amazing. We call them the ‘ old married couple’ they are super cute together, even now being a 9 year old boy and 8 year old girl ;) they always circle back to each other. Its almost like raising twins. With that being said its going to be Crazyville in your house for a while but enjoy the wild, and embrace the crazy. Also, so many people enjoy your blog, Insta and Snaps…please keep it up! Don’t let other’s negativity spoil this awesome time in your life (I’ve seen some of their rude comments!) Being a mother is the hardest job around we should always be supporting and lifting each other up! I love how close you and all your sisters are, I hope my kids will be like that when they get older. Your parents did an awesome job! Old married couple!!! haha I love that. And thanks for leaving such a sweet comment. It means a lot!! And we are LOVING your state! Best wishes to you, Drew and big sister Isla! Oops this went out twice lol! Thanks Leslie!! We are all so excited! That’s amazing! How close in age will they be? Our baby boy was 23 months when his twin sisters were born! So they were there for his 2nd birthday party! It was crazy! But I wouldn’t have it any other way. Now our boy is 5 and our girls are 3! Oh I love that!! What a cute little family! And TWINS!!! :) They will be about 16 months apart, but we are super excited! Yeah and our twins weren’t planned either :) SURPRISE! We knew we wanted lots of kids so I wasn’t on any BC at the time so we knew getting pregnant again was a possibility! I too was shocked by the fact that I was pregnant again, but little did we know that it would be twins!! Ahhhh! The shock of our lives! Haha what a surprise!!! I’m sure you’re the best mom. Congratulations! What exciting news! I am 38 weeks pregnant with another little girl. I got pregnant with her when my 1st little girl was 10 months old. We planned to have them close together. So far I have heard so many positives about have two little ones close together. Your family is beautiful and I can’t wait to see the little one. Thanks Jennifer! I’ve heard so many positives too! Congrats on another girl :) Wishing you the best!! Congratulations!! You look oh so cute! I have a two year old girl and a new baby boy! It is so fun having them so close in age!! Enjoy the adventure! Thanks Amanda!!! We are so excited! Congratulations to you and your sweet, growing family!! So exciting!! Congratulations! :) I am so excited for you. It’s been so wonderful watching your family grow over the past few years. Best wishes for you and your family. Congratulations!! I just came over from Snapchat! One of my greatest joys as a mother is seeing my two boys (3 years and 9 months) play and laugh together. Soon you will experience the same! Congrats on your adorable growing family! Oh how sweet!! I can’t wait to see them interact together. Thanks Gianna! I’m so excited for you guys! This is just like our story. We tried for six years for our little girl, and right around the time she turned one, we found out I was expecting again! It’s been a wild ride but also so fun! I hope you are feeling better! You are adorable pregnant! YAY for baby #2! Thanks Amanda!!! I’m sure it will be a wild ride like you said but I’m so excited for it! Oh my gosh, I literally was just wondering from a recent post if you were pregnant! CONGRATULATIONS!!! What a lucky little one to be brought into such a loving family. Thanks Jillian!! That’s such a sweet thing to say. We sure feel blessed! Congrats! And I applaud you for being so candid about your first pregnancy journey. I had the opposite of you: pregnant with the first in a nanosecond, the second took a long time. Enjoy every minute of your new and (old – ha) baby! all in the same year. They are now 24 and 25 years old. Wishing you a healthy and easy pregnancy. Oh how awesome!! I think it will be great, we sure are excited! Congratulations! Such amazing news I’ve followed your blog for years and am so excited for your expanding family. Such a blessing to have babies so close apart. Can’t wait to hear if it’s a boy or girl! You have the cutest family. Congratulations again. Oh thank you so much Paige!! And thanks for continuing to read my blog, it means a lot :) We’ll find out the gender in a few weeks! Yeay!!! Congrats, I am very happy for your family especially for little Isla, now she will have someone to play with. Thanks Emily! I hope Isla and this baby are the best of friends!!! Congratulations! I had my first baby girl last August, and just found out I’m pregnant again too! Definitely a surprise and blessing! And, I’m nervous about the age gap as well. ;) Mine will be almost 16 months apart. Yours? I loved watching you document your pregnancy with Isla Rose and can’t wait to see you document this pregnancy as well! Oh wow, that is really cool! Thanks for sharing :) I think it will be so fun to have them close together! Aww! Congrats! Your beautiful family is growing. Isn’t God so sneaky sometimes?! When he wants a baby here, he gets them no matter the timing. My little girl was a little over 1 and we found out I was pregnant again. Total shock. I was super nervous too. But He was the sweetest baby and honestly the second baby for some reason sleeps so much better. Maybe it’s because you already expect what is going to happen. But I am so grateful that I had them close.m because now they are older 3 and almost 2 and play together so so well that it is super easy. Love you girl and you will be just fine. Just keep a prayer in your heart always. Oh my gosh congratulations!!!! That is amazing news! Congratulations! What a big surprise. I love reading this story. I had a hard time conceiving too. It took my husband and I over two and half years. I was close to giving up. So I changed my prayers and let God be in control. He answered my prayer in two months. I had a false negative on the day before my birthday in January. I was so shocked when my test came out positive at the end of January. So, we are probably due really close together. Can’t wait to see your pregnancy style. Congratulations with the pregnancy! Just wondering about Florida, was there any “warnings” for pregnant women and the zika virus? I am travelling to Florida in a few months and am a bit worried about the situation getting bigger than it is. Thank you!! I had heard of it but there weren’t any major warnings. I hope you have fun and travel safe there! Thank you for the reply:) Very much looking forward to the sun and warmth, the western coast of Norway is not spoiled with that kind of weather. Aww congrats to you and Drew!!! This is such great news! I bet Isla Rose will be the best big sister, she is adorable and has a contagious smile!! :) Hi from Montreal! I think she will be the BEST big sister, but maybe I’m biased :) haha Thanks so much Josie! Congratulations! What a big surprise. I love reading your story. I had a hard time conceiving too. It took my husband and I over two and half years. I was close to giving up. So I changed my prayers and let God be in control. He answered my prayer within two months. But I didn’t find out until much later. I had a false negative on the day before my birthday in January. I was so shocked when my test came out positive at the end of January. So, we are probably due really close together. Can’t wait to see your pregnancy style. Isla will love her baby sibling. How close in age will they be? My sister and I are 15 months apart and my sister was also a complete surprise because it took my parents over a year and a half to conceive me! haha. Rach – I’m SO thrilled for you all – this brought me to tears this morning! Thank you for sharing your story, as fertility has been an ongoing topic amongst my friends recently. It’s refreshing to hear such an honest, surprising, and lovely story! Congrats!! I’m so so excited for you!!! Yay, Congratulations to you and your growing family! Love your blog and keeping up with you guys on Snapchat! Dasher might be my favorite part =) j/k your whole family makes me smile! Haha we sure love our Dasher boy!! He gets a lot of time on my Snapchat :) Thanks for following along, it means a lot! Congratulations!!! I think they will love being so close in age, especially when they’re older! Love that swimsuit top, too! Ahh!! Congrats!! Love that swimsuit! I am so excited for you!!! Your bump is precious. I have been following you about a year now, as our little girls were born just days apart (my Savannah Grace was born on May 7th). I felt like I was just reading our story! We are expecting baby #2 also, due 15 months after Savannah was born. It was unexpected for us too because it took a while to get pregnant the first time (8 months), so I just didn’t think it would happen this quickly the second time around. Like you, I was still nursing and had ONE period before I became pregnant again. Our “goal” was to start trying around Savannah’s 1st birthday, hoping they would be about 2 years apart. I see it as a huge blessing though that the Lord has chosen us to become parents again so quickly and He obviously knows we can handle it. It’s going to be a crazy ride, but as is life! Hope your morning sickness isn’t as bad this time around. I was very sick with my first, and this time around have had very little sickness (and it’s another girl!!!). Are you finding out? Oh my gosh, our stories are almost exactly the same!!! Congratulations on another girl :) And happy almost first birthday to your Savannah Grace! I had pretty bad morning sickness (all day sickness) for the first trimester, but it’s much better now. We will find out the gender in a few weeks! I have 3 babies (the first two are ONLY 13 MONTHS APART) and I can tell you they will be the best of friends. It will be hard, keep your support of family and your husband near by those first few months and you’ll be just fine. I had the same thing, one period and then pregnant (it was the week between being done nursing and my first and only period in awhile). You’ll love it. But there will be hard parts and exhaustion will get you, but again, they will be best friends. Oh, and get a REALLY good double stroller. Congratulations! I had a feeling! You look beautiful and give me hope that if I get pregnant someday I might have a slight chance of actually looking pretty and not a hot mess! Isla and her sibling are so lucky to have the opportunities you and your husband are able to give them! You are so beyond blessed!! Congrats Rachel! So excited for you and your family for baby number 2! Having two close is age is a lot of work, but so worth it. I have twins and there is nothing better than knowing how close they are to one another. Plus now that they are almost 2 they entertain each other, so I get a break! That news are awesome! Congratulations!!!! I’m very happy for you and your family. I love it to scroll my instgram news and seeing new pictures of you. You are so great! I wish you all the best for your pregnancy. That’s so awesome!! Congratulations! Your bump is already too cute! Congrats!!!! I’m so excited for you and your family! I’m 24 weeks pregnant with my first baby (boy)! I’m excited to know you’ll soon be posting cute maternity photos for inspiration! :) What a joy to be able to conceive this time with out the stress or worry of TTC!! It was just meant to be! Congrats again! Awww, congratulations!! I’m sure it will be so sweet to see Isla and the new baby grow up together as best of friends! :) I’m 17 weeks along with my first baby and started showing pretty recently, so I am extra excited to gather some of your bump dressing wisdom in the coming months! I guessed that the trip may have something to do with your new Rachel Parcell line but in the back of my mind, I was wondering if the other person was actually right. AND THEY WERE!!! What a great surprise Rach!! I’m shocked you hid that delicious bump so well :) You look so stunning pregnant, I’m so happy for you and Drew! Isla Rose and Dasherboy are in for a special treat with the new family member on the way. I hope when I eventually start a family I’ll be as fab a momma, wife, and career woman as you are. So many exciting things coming your way with the new clothing line and now the new babe! Thanks for sharing, I love following you on Insta, snapchat, and here on your blog! Haha there wasn’t hiding it much longer… ;) Thanks so much for following and for your support! Congratulations!!!! What a blessing! And you’ve been hiding it so well… you can’t even tell from any of the pictures that you’ve been posting! It hasn’t been easy!! haha but thank you Lindsay! Ahhh!! Congrats!! That is so exciting! Thank you so much Mariam!! Congratulations Rach..thats great..we will live it with u.
Oh best of luck to you Ana!! I’m so happy for you! Congratulations! I hope you will have a wonderful pregnancy! Your story is so encouraging for me. It took us 1,5years to get pregnant with our son. He’s 8 months old now, we also want our babies to be close in age and I’m afraid that it will take us so long again. We will start trying this cycle und your story makes me optimistic. Thank you for sharing and all the best for you, your new baby and your family. Congrats!! Super excited for you and your growing family. Congratulations Rachel! I´m so happy for you! Congrats!! I am pregnant with my 3rd and they will be 3 under 3 so clearly we like them close together :) The older two are best of friends and it’s great. You will love it .I love your skirt! Can you tell me where you got it? Thanks!! Oh wow, 3 under 3! You can do it :) And my skirt is actually a crop top that I wore as a skirt from Roxy as well. Congrats!!! My sister and I are 15 months apart and I love being so close to my sister! My mom also said it was the best and that she looooved having us so close together! She just talks about how it was nice because after a while we we’re just doing everything together and always had a buddy to play with! Anyway, congrats again and your bump is just the cutest! WOW! Never guessed this…CONGRATULATIONS Rach! You do an amazing job and I bet you will be great with two. I can’t imagine two. I have a 2 yo and I plan on having the next one soon. It’s a bit scary, but we mothers are strong. All the best with the new addition. Congrats!! So exciting! When are you due? Thanks Carly! We are due early September! Congrats. I happened to come across your blog and would like to comment. My two kids are 13 months apart. When I had my second, my first baby was trying to walk. Now they look like a twin. 5 and 4 and they are the best of friends .a girl and a boy. You will be very busy but it so worth it. Good luck. Thanks for commenting and sharing May!! I’m sure I’ll be so busy but we are so excited! Congratulations on adding a new baby to your beautiful, growing family. Isla (beautiful name btw) is going to LOVE having a younger sibling to play with. Hope you have a super smooth pregnancy and can’t wait to read more updates!! Congrats again!!! Congrats!!!! I am so happy for you guys!! Oh my gosh! Congrats on your baby boy – he will be here before you know it! And yes, being a mom is my favorite thing to be. Wishing you all the best! First of all congratulations! Second, I think it’s truly amazing of you to reply to each one of these messages. I don’t know many bloggers who take the time to do that, and I think it’s very kind of you. I have a 7 month old and we are planning our children close together in hopes hey will be best friends. Wow! Congrats!! Same thing happened to me!?? It took me a year to get pregnant with my first so the hubs and I weren’t being too careful when we got the surprise that I was pregnant with our 2nd baby girl when our first was not even a year old yet! I too felt overwelmed and not going to lie it was pretty rough at first but then we got into the swing of things for awhile anyway until we found out our youngest has autism. Anyway I’m happy for you and I pray you have a healthy pregnancy and baby. This was the best surprise! My sister and I are a year and a half apart! It’s so fun when you are close in age. I have a permanent best friend! Isla will be the best big sister! Congrats? Haha seriously!! Thanks for reading and commenting :) it means a lot! You two look beautiful at the beach and congratulations. My son is 8 now and I thought I would have lots by now, but we kept putting it off and now I feel like I waited too long, I think it’s best to have them close like you’re doing. I also got morning sickness all day long, so I hope you feel better this time around. I couldn’t image feeling that way having to take care of a little one. Thank you Noor!! Ya my first trimester wasn’t much fun, but I’m feeling way better and we couldn’t be more excited! My brother and I are 18 months apart and it’s the best thing! So close and going through school together being one grade apart was the best! Don’t be too worried about how close in age your two babies will be! My little sis and I are 1 year and 3 days apart and are incredibly close. She was obviously a surprise for my parents but I can’t even imagine my life without her. Congrats! So not what I was expecting to read on your blog today! The title is very fitting… SURPRISE!! haha :) Thanks Rachel! Congratulations!! Yes, there will be challenges but it will be worth it. I left a message on one of your Instagram post about having another baby because Isla Rose is just to cute. I guess you were already pregnant. May God keep blessing you!! What Great news! I wish you The very best!!! I'm in week 11. And its my first time. And I feel ALLWAYS sick – the hole day. It's very hard, but it's nice to know that I'm not allone! Congrats to you Nicki!! I am always SO sick during my first trimester, but then it goes away and I feel 100% better. Hang in there!! I’m almost half way :) Wishing you the best! Oh my gosh that’s just the most wonderful news! Congratulations to you and Drew. I wish all the best with your pregnancy and hope you are a little less sick this time! All the best to you and your sweet little family! Congratulations to you, Drew, Isla, and Dasher! Congrats Rachel! Love following your blog, Instagram, and snap chat! You’ve really inspired my style over the past few years that I’ve been following you. So excited for you, Drew,and Isla to be welcoming a new little one into your family! We just had our second baby girl 2 months ago and our first was only 17 months when her little sister was born! It’s such an exciting but somewhat terrifying thing to have them come so close to each other! So far the first couple weeks were the worst with the adjustment but now we’re all into a pretty good routine and our oldest just ADORES her little sister! Can’t wait to continue to watch your little family grow! You’re a wonderful mom, and you look amazing for being halfway there already!! I am over the moon excited for you!!! You are so very blessed! I see how close you and Emily are, especially when you called her instead of telling Drew, lol. I am happy that your children with have the same type of bond since they will be so close in age. Congratulations! Oh my, thank you so much Nadine!!! And thanks for continuing to follow along :) it means a lot. Congrats!Have a great pregnancy,enjoy…and don-t think now about the rest.U will know how to manage all in the wright time.i-m glad to see such a beautiful family! Exciting news!!! Congrats … my baby is 17 months now and im also pregnant almost 17 weeks in so i too an excited and scared at the same time … i feel like wer due around the same time so cant wait to have my autumn baby and share journies with someone from the other part of the world! Oh that is so exciting!!! Thanks for being so sweet :) Wishing you the best! Congratulations! I’ve been wondering but you threw us all off track nicely when you announced your clothing line! I also just wanted to congratulate you on the way you handle sponsored /partnered posts. You’re one of the very few bloggers I follow who actually write a really interesting post alongside the sponsored content and I enjoy reading it. Some people become too much about the advertising and I get that you need to be paid, but you’ve hit the perfect balance and I love checking out what you’ve got to say! Looking forward to following your pregnancy! Congratulations! I just brought home my first baby yesterday. It’s the most amazing experience in the world. In my case, due to a medical diagnosis, this will be my only baby (it took nearly five years, four failed rounds of IUI and then IVF with PGD testing before we were finally able to conceive), so you’re very blessed that you get to experience it again. Best wishes to you and your lovely family. Oh how amazing for you!! I remember when we brought home Isla we were so excited and so scared! haha enjoy every second with that precious baby! Congratulations! I just want to share with you how much I appreciate you writing that it took awhile to get pregnant with Isla… I’m 26 and have only been trying for six months, but it’s been the longest six months of my life, and its been really emotionally taxing. I’m starting my second round of Clomid in a couple weeks, and it was comforting reading that someone I see as having a picture-perfect life also had to take Clomid. It helped boost my morale a little yesterday when I read your blog post, so thank you for your honesty, and congratulations to you and your beautiful family! A massive congratulations to you and your growing family – wishing you all love, health and happiness! Congratulations!!!! I am so excited for you and your family. I just love your blog and your Instagram. You have such Exquisite style and are such an elegant young lady. And Isla Rose, such a cutie. She always makes me smile. Thank you so much Sue, you are so sweet!! First off, congrats on your 2nd little blessing! I know the feeling as I have 2 nuggets that are 15months apart. I got the same advice from parents who have children close in age: it’s going to be challenging for the first 15 months, but after that it is amazing! They’re laughing & playing with one another & are literally the best of friends. Going from 1 baby to 2 is more challenging than it initially appears because you won’t be able to tag team anymore so definitely have plenty of support (which I believe you do!) and it will be less stressful during that period. God bless you & your growing family! Thank you so much for the advice!! I really appreciate it and need all the advice I can get about having two kids close in age :) haha so thanks for sharing! I bet you’re an amazing mother. So happy for you–as you know from your experience, it truly is a miracle and a blessing when the stars align! Amazing pictures. I also use Canon camera (400D) and now I want to buy the 70D. Oh thanks Bianca!! Isn’t Canon the best?! Thank you Quicha!!! The nausea was pretty bad during my first trimester but thankfully it’s gone now! Congratulations to you and your family…this is so exciting!! Thanks Cathy, it means a lot! oh my gosh rach!!!! this is so exciting!!! I am so happy for you!!! congrats love! Thanks Alyssa! I’m excited to share this journey with all of you! I’m so happy for you and Drew! Congrats on baby number 2! My first comment ever on your blog — I’ve been a silent fan for years — but a baby is reason to say congratulations! I cannot tell you how excited I am for you, Drew, Isla Rose and Dash! You’re such a sweet little family and I’m excited for your second baby to come along. So sweet! I’ve been following your blog & IG for a while now, and I have to tell you that you just have the most wonderful family!! Your home and style is so classy I am beyond excited to snag some pieces from your line. Love that you decided to do your own thing! I am so excited for you and your growing family and hope to find my man one day so I can follow suit :-) Congratulations!! Congratulations! I just wanted to let you know what an amazing blessing it is to have your children so close in age. My girls are 11 months apart and are now 10 and 11 and are the best of friends. The first couple of years are challenging, but with the love and support from your family, it will be a beautiful thing! Take care of yourself and get plenty of rest! Also savor these moments with Isla! Again, congratulations on your growing family! Congrats! I had no idea you were pregnant! I thought when you posted the picture on set that you were modeling with a fake bump to show some maternity clothes you designed! Super observant over here. It wasn’t until today that I saw your post about your growing belly that I realized you were actually pregnant! Again, so happy for you, best of luck to your growing family and new clothing line! Excited to see what you create and all you accomplish this next year. I just bought the swim top! Thank u! =) may I ask where u got the short bottoms? Congrats on your new babe! I have adored your blog for years and have enjoyed watching your family grow. Could you tell me where the swim skirt came from? I didn’t see it linked. Thanks so much! I saw your Instagram and immediately had to find this post! Super congrats to you!!! I just had my second son and my boys are only 17 months apart. I also only had one period before getting pregnant and I did not expect it would happen so quickly! I am very glad they are close in age though. Id like to have more kids and I’m not getting any younger. ;) so far it is going well because I think you’ll just be more confident with the second baby. But I did not expect that at 17 months my son wouldn’t be walking independently yet, so that’s a bit of a struggle! Good luck to you and congrats again!! Oh really?! That is so exciting!! Thanks for commenting and sharing :) I’m glad you did! Best of luck to your little family! This is exactly what happened to me! I’ve been searching for other stories to relate to and remembered you had yours very close together. Mine will be 15 months apart and I’m freaking out because I work full time and don’t know how we’ll manage but know it will be worth it. Definitely a huge shock but total blessing! Any advice to share would be so greatly appreciated! !